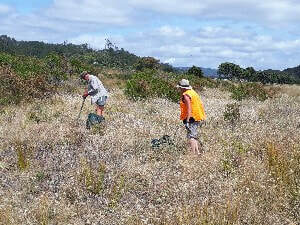 Weeding and rubbish removal from our dunes is performed by a dedicated group every week. 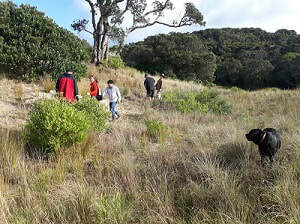 The first Beachcare dune restorations were initiated by property owners at the eastern end of Cooks Beach. The assistance of a digger was needed to restore this dune in September 2015. Following a fantastic planting day in 2016 a series of storms in early 2018 have set back this areas restoration. Our planting day on 4/6/17 saw over 3000 natives planted on this dune. On 11/01/2018 DOC and a group of volunteers removed large amounts of this pest. 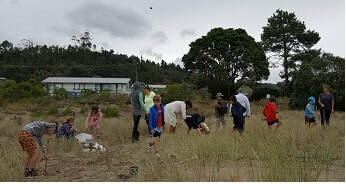 On the 10/04/2018 students made a wonderful contribution to the Cooks Beach dunes. 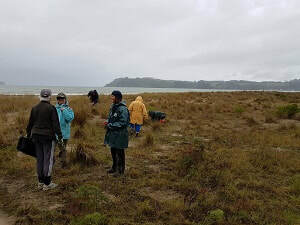 On 17/05/2018 DOC and a group of volunteers planted 700 native dune plants. After being postponed from the Sunday to Monday, a group of hardy volunteers did a wonderful job.